Introducing the Exclusive SENHENG redONE Promotion ! Available ONLY on Every 28th Day of the Month. 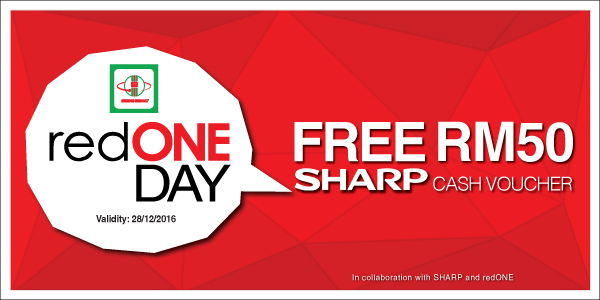 Enjoy FREE RM50 Sharp eVoucher when you purchase Sharp Product at RM100 and above in a single transaction. Introducing the redONE Day Promotion for all our valued redONE Customers! Available only on Every 28th DAY OF THE MONTH beginning from December 2016 onwards ! 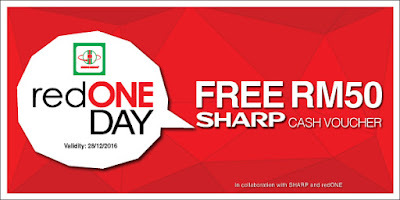 Receive a FREE RM50 SHARP eVoucher when you purchase SHARP Product at RM100 amount and above in a single transaction ! Promotion available on 28th December 2016. Applicable to redONE members only. Hurry up ! Visit your nearest SENHENG Showroom to enjoy this on Every 28th DAY OF THE MONTH.